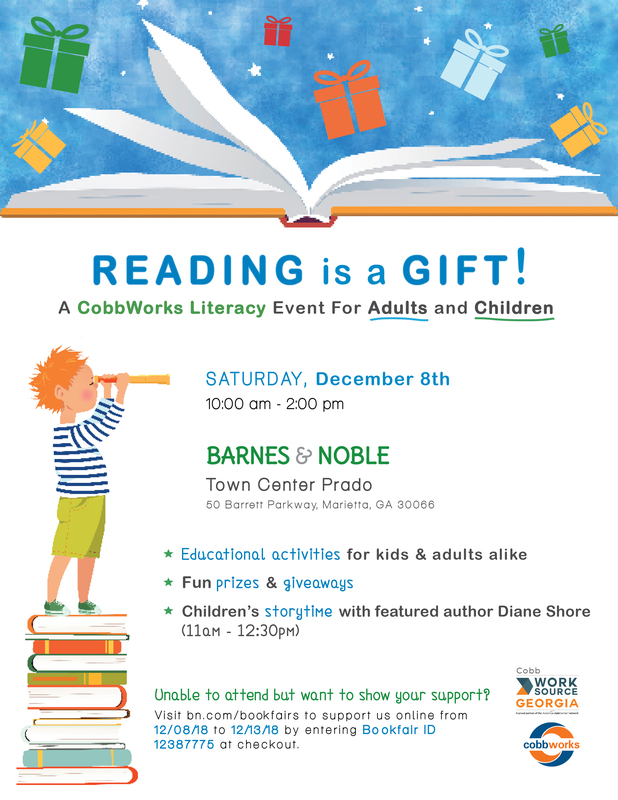 CobbWorks Literacy Council (CLC) is teaming up with Barnes and Noble to hold Reading Is A Gift, an event to raise literacy awareness in Cobb County, on Saturday, December 8, 2018 at Barnes and Noble Town Center Prado located at 50 Barrett Parkway, Marietta, GA 30066 from 10:00 am to 2:00 pm. There will be fun and interactive activities for both children and adults alike, including a literary scavenger hunt. Attendees will also have the chance to win a Nook. This is the third year collaborating with Barnes and Noble for this type of event. CLC hopes to promote reading and raise awareness for literacy within Cobb County through children and adults. Attendees can also expect fun yet informative stations on relative topics throughout the store as they shop. The children’s area will have activities specifically geared toward their interests. There will also be a story hour with featured author, Diane Shore, to instill an appreciation and enjoyment for reading.